Dorsoventrality in leaves has been shown to depend on the pre-patterned expression of KANADI and HD-ZIPIII genes within the plant shoot apical meristem (SAM). However, it has also been proposed that asymmetric auxin levels within initiating leaves help establish leaf polarity, based in part on observations of the DII auxin sensor. By analyzing and quantifying the expression of the R2D2 auxin sensor, we find that there is no obvious asymmetry in auxin levels during Arabidopsis leaf development. We further show that the mDII control sensor also exhibits an asymmetry in expression in developing leaf primordia early on, while it becomes more symmetric at a later developmental stage as reported previously. Together with other recent findings, our results argue against the importance of auxin asymmetry in establishing leaf polarity. The mature leaves of seed plants are usually flat with distinct cell types making up their dorsal (upper) and ventral (lower) tissues, which are derived from the adaxial (side closest to meristem) and abaxial (side farthest from meristem) primordium tissues. A fundamental question in plant development is how this tissue patterning is first specified. Recently, we reported evidence in support of a previously proposed hypothesis that dorsoventral leaf patterning is derived from a pre-pattern present in the shoot apical meristem (SAM), where leaves arise (Hagemann and Gleissberg, 1996; Husbands et al., 2009; Kerstetter et al., 2001; Koch and Meinhardt, 1994). We found that transcription factors that promote dorsal and ventral leaf cell types are expressed in the SAM in a pre-pattern that determines the orientation of the leaves that subsequently form (Caggiano et al., 2017). Additionally, we found that the plant hormone auxin promotes dorsal cell fate by maintaining expression of the Class III HD-ZIP transcription factor REVOLUTA (REV) and repressing KANADI1 (KAN1) expression in the adaxial cells of organ primordia (Caggiano et al., 2017). 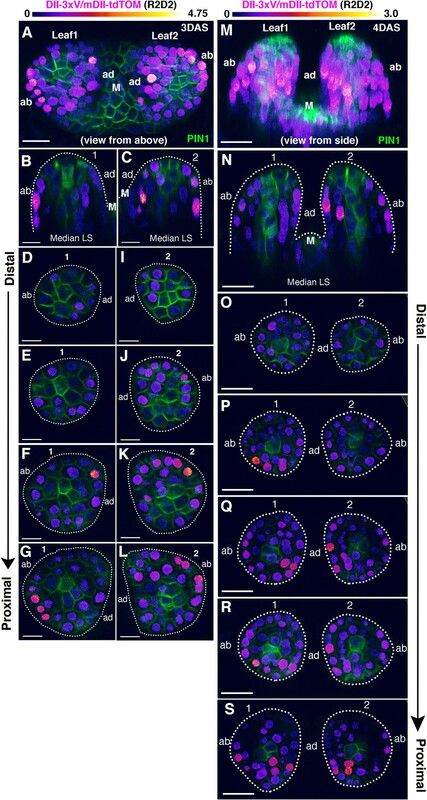 These findings however contrast with that of another study which concluded that leaf polarity is dependent on an asymmetry in auxin levels within leaf primordia, with relatively low levels of auxin in adaxial cells compared to abaxial cells being critical to maintain dorsal identity (Qi et al., 2014). This conclusion was based in part on the finding that exogenous auxin application to tomato leaf primordia resulted in the formation of radialized leaves that appeared ventralized. Also, it was found that an auxin sensor, the DII (Brunoud et al., 2012; Vernoux et al., 2011) indicates low levels of auxin in adaxial leaf tissues compared to abaxial tissues at leaf initiation (Qi et al., 2014). Hence asymmetries in auxin concentrations between the adaxial and abaxial tissues in leaf primordia, as a result of PIN1 mediated auxin transport, were proposed to help establish leaf dorsoventral cell type patterning (Qi et al., 2014), in contrast to the proposed pre-pattern mechanism (Caggiano et al., 2017). Building further on this conclusion, a more recent study proposed that low levels of auxin in adaxial primordium tissues are necessary to restrict the expression of the WOX1 and PRS genes to the middle domain, since auxin promotes their expression (Guan et al., 2017). Finally, the reported asymmetry in auxin has also been linked to asymmetries in the mechanical properties of leaf tissues and their morphogenesis (Qi et al., 2017). In-order to investigate the proposed auxin asymmetry proposal in more detail, we decided to examine the distribution of auxin within initiating leaf primordia using the ratio-metric R2D2 reporter, which acts as a proxy for the cellular sensing of auxin (Liao et al., 2015). A high DII/mDII ratio indicates relatively low levels of auxin sensing while a high mDII/DII ratio indicates relatively high levels of auxin sensing (Liao et al., 2015). We first focused on the incipient stages when PIN1 convergence patterns are established, by looking at later forming primordia (third, fourth or fifth) in seedlings 4-5DAS (days after stratification). In general, during these early stages DII/mDII ratios were extremely low in cells coinciding with high levels of PIN1-GFP expression while on either side of these cells, ratios were higher but to a similar degree (Figure 1). Previously, by examining PIN1-CFP together with pREV::REV-2xYPet and pKAN1::KAN1-2xGFP in similarly staged primordia we found that REV expression can coincide with PIN1 at later stages when it expands peripherally but that KAN1 expression is invariably complementary to cells with high PIN1 expression (Caggiano et al., 2017). Overall our observations therefore indicate that KAN1 expression is associated with low auxin sensing cells while REV expression is associated with different levels of auxin sensing depending on the stage of development. We then examined DII/mDII ratios in the leaves after initiation. For this we imaged the first two leaves when they are approximately 4–5 cells long along their proximo-distal axis (3DAS), as well as a day later as they begin to elongate (6–9 cells along the proximo-distal axis; 4DAS) and again included the PIN1-GFP marker in our analysis to correlate cellular auxin sensing with PIN1 expression and polarity. At 3DAS, the expression patterns of REV and KAN1 are already polar within such primordia, although the FILAMENTOUS FLOWER (FIL) expression domain at this stage of development is still being refined (Caggiano et al., 2017). At this stage, PIN1 is polarized towards the distal tip of leaf primordia but has reversed polarity away from the primordia, towards the meristem, in cells adjacent to primordia on the adaxial side. According to the ratio-metric auxin sensor R2D2, DII/mDII ratios varied from moderate to high in adaxial cells of the primordia but also varied similarly in abaxial regions - indicating no obvious asymmetry between the two tissue types (Figure 2A to C and M-N; Figure 2—figure supplements 1 and 2). 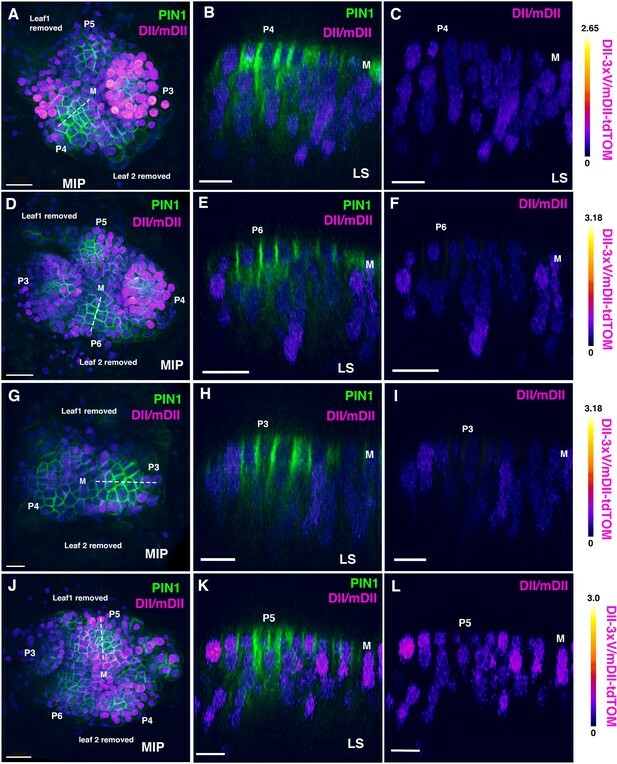 A low DII/mDII ratio was only found consistently in more distal regions towards the tip of the primordia and in the provasculature, matching the overall pattern of signal from PIN1-GFP. By carefully monitoring DII/mDII ratios from the distal to proximal end of the initiating leaves, the variability in DII/mDII ratios within adaxial and abaxial tissues was clearly apparent (Figure 2D–L and O–S, Figure 2—figure supplements 1 and 2). This same overall pattern of signal was found in 28 out of 28 leaves that were examined each for 3DAS and 4DAS (14 seedlings each). Lastly, by inverting the ratio and visualizing the mDII/DII (high ratio intensity corresponding to high cellular auxin sensing), we could further confirm that high levels of auxin sensing were only found in the more distal regions towards the tip of the primordia and within the provasculature, where PIN1-GFP was expressed (Figure 2—figure supplement 3). Distribution of DII/mDII ratio intensities in incipient leaf primordia (third, fourth or fifth). 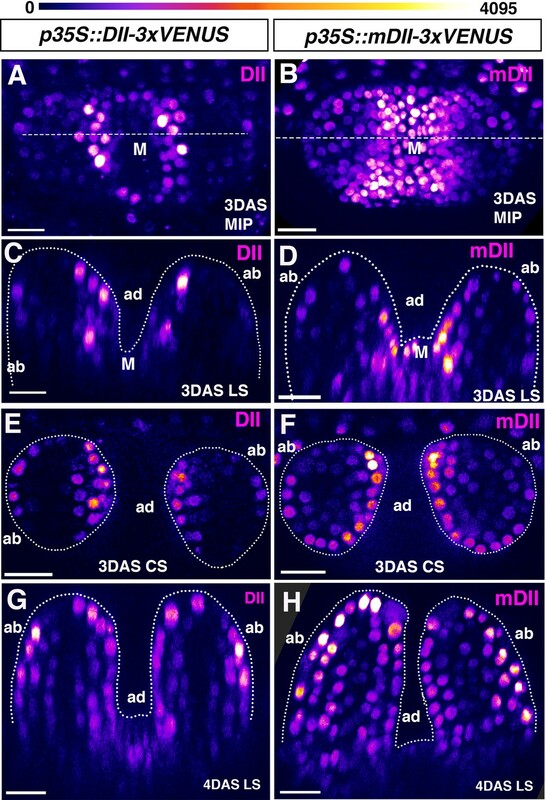 (A, D, G, J) Confocal projections of Arabidopsis seedlings aged 4 or 5 DAS (days after stratification) showing DII/mDII ratio intensity distributions (magenta) along with PIN1-GFP (green) in third, fourth or fifth leaves. (B–C, E–F, H–I, K–L) Corresponding median longitudinal optical sections of incipient primordia along the dashed lines in (A,D,G,J) showing DII/mDII ratio intensity distributions (magenta) along with PIN1-GFP (green) (B, E, H, K) and DII/mDII ratio intensity distributions only (magenta) (C, F, I, L) . Primordia are numbered starting oldest (P3) to youngest (P6). Scale bars 20 μm (B and D), 15 μm (A, C, and F-H) and 10 μm (E). M marks the meristem. Distribution of DII/mDII ratio intensities within initiating leaf primordia (first and second). (A and M) Confocal projections of Arabidopsis seedlings aged 3 and 4 DAS (days after stratification) showing DII/mDII ratio intensity distributions (magenta) along with PIN1-GFP expression (green) in the first two leaves. (B, C, N) Corresponding median longitudinal optical sections of first two leaves in (A) (B and C) and in (M) (N). Note no obvious asymmetry in DII/mDII ratio intensities on the adaxial vs abaxial sides of the leaves at 3DAS or 4DAS. (D–L) Optical reconstructions of cross-sections of leaves in (A) along the distal (D) to proximal axis (L). (O–S) Optical reconstructions of cross-sections of leaves in (M) along the distal (O) to proximal axis (S). Note variability in DII/mDII ratio intensities h associated with nuclei within the adaxial and abaxial domains of individual leaves. Scale bars 15 μm (A), 10 μm(B-L), 20 μm (M–S). M marks the meristem. Although the detection of variable R2D2 ratios in adaxial and abaxial cells already argues against a critical role for the distribution of auxin in patterning leaf dorsoventrality, we decided to further investigate the spatial patterns of R2D2 quantitatively. Using PIN1-GFP marked vasculature as a dividing line to demarcate adaxial and abaxial tissues, we manually cropped adaxial and abaxial confocal volumes from our confocal image stacks of 4DAS old leaves expressing R2D2 using ImageJ (Fiji; https://fiji.sc) (Figure 3A and B). We then processed these data using a pipeline that included deconvolution of the image stacks, segmentation of nuclear volumes and calculations of R2D2 ratios averaged over the segmented nuclear volumes (Figure 3C–E) (Materials and methods). The aggregated ratios from 20 leaves (10 seedlings) illustrated as separate violin plots for adaxial and abaxial leaf tissues reveals high variability between individual nuclei throughout the leaves and very similar ratio distributions between adaxial and abaxial nuclei (Figure 3F and G). According to the data, abaxial tissues have a slightly larger proportion of cells with high DII/mDII ratios (low auxin sensing) with a mean of 0.29; standard deviation, SD (0.24); standard error of mean, SEM (0.01) compared to adaxial tissues, which have a mean ratio of 0.24, SD (0.20), SEM (0.004) (Figure 3G). Similar distributions are found for individual leaves (Figure 3F), although there is leaf to leaf variability, which is also apparent in the spatial distribution of ratios within and between leaves (Figure 3—figure supplement 1). Given that the data are not normally distributed we analysed the similarity of the distributions using a plot of the ranked ratios from aggregated adaxial and abaxial nuclei. The Area Under the Curve (AUC) measure of similarity was found to be 0.556, which again indicates that the distributions are overall very similar (0.5 would indicate they are identical) (Figure 3H). All together our results demonstrate that the relative levels of auxin sensing in adaxial and abaxial tissues in young leaf primordia, are overall, very similar. The small difference we identify is that a larger proportion of cells in abaxial tissues display higher DII to mDII ratios compared to adaxial tissues, indicating slightly higher levels of cellular auxin sensing in adaxial tissues, which is the opposite conclusion to that reported earlier (Guan et al., 2017; Qi et al., 2014). However, we again would like to emphasize that overall, the ratio distributions are very similar. Quantification of DII/mDII ratio intensities within the nuclei of the first two leaves in 4DAS old seedlings. (A) Representative example of adaxial and abaxial volume estimation and cropping. Snapshot of a single optical slice from a z stack of 4DAS old seedlings showing manual demarcation of adaxial and abaxial cells for cropping (yellow outlines) along the domain of PIN1-GFP expression (gray) in the vasculature. (B) Example of resulting nuclear categorisation after cropping, grouped by abaxial (blue), adaxial (yellow), and discarded tissue (magenta). (C–E) Quantification steps in 3D nuclei, illustrating the initial signal (C), subsequent nuclear segmentation (D), and the resulting DII/mDII ratio within the nuclear volumes (E). (F and G) Violin plots of the distributions of the ratios of mean expressions for abaxial and adaxial nuclei after quality filtering, per seedling and all data pooled together. Jitters show the individual data points (F), and internal boxplots the median values and distribution quartiles, with whiskers extending to 1.5 times the interquartile range (IQR) (G). (H) Ranked ratio Area Under the Curve (AUC) plot and score for the distributions. Abaxial n = 1475, adaxial n = 2006, accumulated over 10 seedlings (20 leaves). Distribution values are given as the ratio of normalised mean DII-3xVENUS-N7 over mean mDII- tdTomato (R2D2) expression within the segmented nuclear volumes. As our results using the R2D2 auxin sensor indicate a different cellular auxin sensing pattern compared to that reported previously using the DII marker (Qi et al., 2014), we decided to re-examined the pattern of DII auxin sensor expression at the same early developmental stages. In contrast to the R2D2 pattern, the DII pattern showed an asymmetry of expression in leaf primordia at 3 DAS, indicating relatively low auxin levels in adaxial primordium cells, as found previously. DII signal appeared strongest in the adaxial epidermis but was also stronger in the adaxial sub-epidermal cell layer compared to abaxial epidermal and sub-epidermal cell layers (Figure 4- A, C, E and Figure 4—figure supplement 1) (n = 18/18 leaves, nine seedlings). One day later, DII signal started to show increased relative expression in the abaxial epidermal and sub-epidermal layers compared to earlier stages (n = 14/14 leaves, seven seedlings) (Figure 4G). At least for very young primordia, aged 3DAS, our results are similar to those obtained previously and consistent with the proposal that there are low levels of auxin in the adaxial regions of leaf primordia, in contrast to our results using the R2D2 sensor. Given this discrepancy, we next examined the expression of the mDII sensor which is driven by the same 35S promoter as the DII sensor but is not auxin sensitive. Surprisingly we found that, like the DII results, expression of the mDII marker was also higher in the adaxial cells of leaf primordia at 3DAS (n = 16/16 leaves, eight seedlings) (Figure 4-B,D,F and Figure 4—figure supplement 2). The pattern appeared almost identical to the pattern found using the DII marker except that the mDII marker also exhibited high levels of expression in the shoot meristem whereas the DII sensor did not (compare Figure 4-A,B; Figure 4—figure supplement 1A–G and Figure 4—figure supplement 2A–F). The similarity of expression between DII and mDII was also apparent at 4DAS when both markers started to show expression on the abaxial side as well with no obvious asymmetry in their expression (n = 20/20 leaves, 10 seedlings) (Figure 4H-Figure 4—figure supplement 3). To verify the auxin sensitivity of the sensors used we imaged seedlings before and after treatment with 5 mM NAA and found a strong decrease in DII expression compared to mDII and an increase in the mDII-tdTom/DII-V ratio for the R2D2 sensor, consistent with an increase in auxin levels (Figure 4—figure supplement 4). Signal intensity distribution in young leaves generated by p35S driven auxin sensor and control. (A and B) Confocal projections of Arabidopsis seedlings aged 3DAS (days after stratification) showing expression pattern of p35S::DII-VENUS (magenta) (A) and p35S::mutatedDII-VENUS (mDII, magenta) (B). (C and D) Longitudinal reconstructed optical sections of (A and B), respectively, along the dashed lines. (E and F) Representative examples of transverse reconstructed optical sections of 3DAS Arabidopsis seedlings showing DII-VENUS expression (E) and mDII-VENUS expression (F). DII-VENUS is more strongly expressed adaxially indicating low auxin sensing on the adaxial side of the leaves relative to the abaxial side. However, mDII-VENUS also shows high expression on the adaxial side of the leaf (compare E with F) and in the shoot meristem. (G and H) Representative examples of longitudinal reconstructed optical sections of 4DAS Arabidopsis seedlings showing DII-VENUS expression (G) and mDII-VENUS expression (H). At this stage, the DII-VENUS shows a more uniform expression and absence of expression in the vasculature. mDII-VENUS also shows a similar pattern to DII but is also expressed in the vasculature (H). Scale bars 15 μm (A and C) 20 μm B, (D, E–H). Figure Supplements. The finding that both the mDII and DII markers, when driven by the 35S promoter, are expressed in an asymmetric pattern during leaf initiation suggests that one reason our conclusions may differ from those reported earlier (Qi et al., 2014) is that previously, the DII marker was used to assess relative auxin levels without direct comparison to the mDII marker. We note that although a single section showing expression of the control mDII sensor in older leaves was cited by Guan et al., 2017 (Wang et al., 2014), this information was not adequate for properly assessing similarities and differences, emphasizing the importance of using ratio-metric reporters and quantitative analyses. More recently, these authors have posted a pre-print reporting data for both R2D2 and mDII markers in leaf primordia and concluding that the 35S promoter driven mDII marker is not asymmetric at early leaf stages and that R2D2 ratios again indicate lower auxin levels in adaxial leaf tissues (Guan et al., 2018). However for the R2D2 data, the analysis is again based on arbitrarily chosen sections taken from confocal volumes. Regarding the 35S mDII data, the leaves shown have developed to a later stage compared to the leaves we analyze at both 3DAS and 4DAS (4–6 cells long in this study vs 8–9 cells at 2DAS and 6–9 cells in this study vs 9–11 at 3DAS). As our time-lapse imaging shows, the pattern changes rapidly over 12 hr (Figure 4—figure supplement 3) and so a staging discrepancy can explain this difference. In summary, our findings strongly argue against the proposal that asymmetries in the distribution of auxin within young leaf primordia have a strong influence on leaf polarity (Qi et al., 2014) or regulate tissue mechanics (Qi et al., 2017). Might low levels of auxin in adaxial tissues still limit the pattern WOX1 or PRS gene expression (Guan et al., 2017)? In this study, we find high levels of auxin sensing in presumptive provascular cells that also express high levels of PIN1-GFP. Is this where WOX1 and PRS are normally expressed? In fact simultaneous imaging of PIN1-GFP together with PRS-GFP in young leaf primordia indicates that PRS expression is not restricted to cells with high PIN1-GFP expression, although they are both in the middle domain (reconstructed transverse optical section; Figure 4E of (Caggiano et al., 2017)). More significantly, it was shown that if auxin is applied exogenously, WOX1 and PRS do not become expressed ectopically (Caggiano et al., 2017). Overall then, our data argue against a role for auxin in limiting WOX1 and PRS expression to the middle domain. Rather, they support previous results indicating that, like the ventrally expressed KANADI and Auxin Response Factor genes (ARF2, ARF3 and ARF4), the adaxially expressed HD-ZIPIII genes restrict auxin response, thereby limiting WOX1 and PRS expression to the middle domain whether the level of auxin in adaxial cells is high or not (Caggiano et al., 2017). Our results do however leave other observations unexplained. In particular, to understand the apparent ventralisation of leaf primordia in tomato in response to exogenous auxin (Qi et al., 2014) will require further work in assessing how auxin distribution patterns change in response to exogenous treatments and how auxin is distributed during regular development in tomato, preferentially using a ratio-metric auxin sensor such as R2D2. Seeds of the plants expressing p35S::DII-VENUS and p35S::mDII-VENUS transgenes (Columbia ecotype) were obtained from Dr. Teva Vernoux (Brunoud et al., 2012). An independent batch of seeds expressing p35S::mDII-VENUS transgenes (Columbia ecotype) was also obtained from NASC (Arabidopsis stock center, NASC ID: N799174) for analysis. R2D2 reporter (pRPS5::DII-3xVN-7 and pRPS5::mDII-tdTOMATO-N7) line carrying pPIN1::PIN1-GFP transgene (Landsberg ecotype) has been described previously (Bhatia et al., 2016; Liao et al., 2015). Seeds were germinated and grown on GM medium (pH-7 with 1M KOH) containing 1% sucrose, 1X Murashige and Skoog salts (Sigma M5524), MES 2-(MN-morpholino)- ethane sulfonic acid (Sigma M2933), 0.8% Bacto Agar (Difco), 1% MS vitamins (Sigma M3900) in continuous light. Seedlings aged 3DAS (days after stratification) and 4DAS were dissected as described previously (Bhatia et al., 2016). For imaging third, fourth and fifth leaves, the first two leaves of seedlings aged 4DAS, 5DAS or 6DAS were removed using a fine needle (0.45 × 13 mm). For imaging seedlings aged 3DAS, they were positioned and oriented such that the imaging plane was perpendicular to the first two leaves along the dorso-ventral axis. For imaging 4DAS, seedlings were oriented and imaged such that the imaging plane was at 45º−50º angle (by inserting only the tip of the intact cotyledon into the medium) to the first two leaves along the dorso-ventral axis. These orientations were selected to minimize any possible shading and also to re-construct both transverse and optical sections from the same image stacks. Imaging set up of 4DAS used for adaxial-abaxial volume cutting and DII/mDII quantification is described below. Seedlings were imaged live, on a Leica TCS-SP5 upright confocal laser-scanning microscope with hybrid detectors (HyDs) using a 25X water objective (N.A 0.95). VENUS was imaged using argon laser (excitation wavelength 514 nm) while tdTomato was imaged using a white light laser (excitation wavelength 561 nm). Z-stacks were acquired in a 512 × 512 pixel format, with a resolution of 12-bit depth, section spacing of 1 μm and line averaging 2. Ratio-metric calculations for R2D2 auxin sensor were performed using ImageJ (FIJI, https://fiji.sc) in two ways. 1.For DII/mDII calculations (negative readout of auxin sensing), DII signal was normalized against mDII (such that mDIImax intensity = DII max intensity). A binary mask was generated from mDII channel and was applied to both DII and mDII channel. The resultant DII channel was divided by the resultant mDII channel. Since the values after division were lower than 1, the ratio image was generated as a 32-bit-float and exported as tiff series. PIN1 channel was also exported in 32-bit to visualize the ratio along with PIN1 expression in IMARIS (version 9.2.1) (see below). 2.For mDII/DII calculations (positive readout of auxin sensing), The DII signal was normalized against the mDII signal (such that mDIImax intensity = DII max intensity). The mDII-tdTOM channel was divided by the DII-3XV channel. The calculated image was duplicated and then segmented using intensity threshold- based segmentation to create a binary mask with pixel value inside the nuclei one and outside the nuclei to zero. Masking was done to set all the values outside the nuclei uniformly zero. This mask was then multiplied to the original ratio calculated image to set the intensity values in cells with low auxin close to background (zero). The result appeared in a new window and was exported as a tiff series (Bhatia et al., 2016). Both of these protocols are specific for images captured with a resolution of 12-bit. The tiff series were then opened in IMARIS 9.2.1 (bit-plane) and processed further. Optical sections (transverse or longitudinal) were reconstructed using oblique slicer in IMARIS. If the orientation of the first two leaves was different to each other with respect to the meristem, different oblique slicers were used. This was done to position the slicers parallel to the leaf proximo-distal axis and perpendicular to the dorso-ventral axis to generate precise optical sections. The optical sections are 2 μm in thickness. DII/mDII ratio quantifications were performed on the leaves of seedlings aged 4DAS. During imaging, seedlings were positioned and oriented such that the imaging plane was perpendicular to the first two leaves along the medio-lateral axis. This orientation allowed a clear demarcation between adaxial and abaxial side based on PIN1-GFP expression in the vasculature. 3D volumes were cropped in Fiji along PIN1-GFP expressing cells in the vasculature as shown in Figure (3A and B). Median optical slice for each leaf was chosen to draw the Region Of Interest (ROI) to crop adaxial or abaxial volumes of the leaves. Before cropping, all the slices were visualized to ensure the chosen ROI covered all the cells in adaxial or abaxial side. We did not consider potentially cropped (partial) nuclei differently than others during the segmentation. All cropped images were deconvolved using the psf Python library (https://www.lfd.uci.edu/~gohlke/code/psf.py.html) for generating point-spread functions, and the Richardson-Lucy iterative algorithm (Lucy, 1974; Richardson, 1972) in the Scikit-Image (v. 0.14) library (van der Walt et al., 2014) for restoration. Similarly, we applied a Wiener filter (Wiener, 1949) from the Scipy library (v. 1.1.0) (Jones et al., 2001). All microscopy settings used for the deconvolution are made available in the supporting code repository. Before segmentation, the images were thresholded using Otsu’s method (Otsu, 1979). Median and Gaussian filters were then applied sequentially at various iterations to reduce salt-and-pepper noise, and for general smoothing of the input signal. In order to quantify the input data, we developed a Python implementation of the ImageJ plugin Costanza (http://www.plant-image-analysis.org/software/costanza), denoted pyCostanza, which was further improved for maintainability and flexibility. Both the ImageJ plugin and pyCostanza are freely available via the Sainsbury Laboratory gitlab repository (https://gitlab.com/slcu/teamHJ/Costanza; copy archived at https://github.com/elifesciences-publications/slcu-teamHJ-Costanza) (Åhl et al., 2018). where x denotes the spatial position (unit length) of the current of neighbouring voxel, and I the corresponding intensity. The neighbourhood can be chosen as desired, with common and useful options being spherical, cubical, and cross-shaped neighbourhoods. After identifying the neighbouring voxel maximising the metric, the pair are connected in a graph. Subsequently, the resulting connected regions (basin-of-attractors) after all voxels have been visited correspond to initial approximations of the objects in the image. An attractor is defined as the voxel with the highest intensity within the corresponding basin-of-attractor. Merge, Distance: Attractors within a given (Euclidean) distance of each other are merged together. Merge, Depth: Neighbouring domains are merged together if the intensity depth of a domain is less than a given threshold. The intensity depth is defined as the difference between the maximal intensity value in either region, and the minimal intensity value in the boundary between the domains. Merge, Small2Closest: Domains under a certain size (volume) are merged with the closest domain of a volume bigger than the given threshold. A maximal upper limit for whether domains shall be merged or not can be set. Remove, Size: Domains are removed based on a volume threshold. Remove, Intensity: Domains are removed based on the (mean) intensity within the domain. pyCostanza also includes functions for performing morphological erosion, dilation, opening and closing operations on the labels. The unprocessed DII and mDII signals were normalised under the assumption that the maximal DII signal corresponds to the maximal mDII signal, due to mDII representing non-degrading DII. That is, the DII signal was linearly transformed such that max(DII):=max(mDII) for voxels with a non-background label, resulting in ratios within [0, 1]. The corresponding data per labelled object were extracted from the image using the Scikit-Image function regionprops. Specific attributes extracted were label centroids, mean DII intensity, and the mean mDII intensity. The intensity ratio, taken as the DII signal relative to the mDII signal, was calculated from these values. For identification of spatial distribution patterns, label centroid coordinates were downprojected in the XY-plane of the input image such that the intensity value of the voxels correspond to the signal ratio (Figure 3—figure supplement 1). All nuclei were filtered based on signal strength and size to account for over and under-segmentation, as well as possible included parts of the background. Seedlings aged 3DAS were dissected imaged and treated with approximately 10 μL of 5 mM NAA (1-Napthaleneacetic acid) solution in water (0.5M stock in 1M KOH) for 60 min and imaged again with same settings as prior to treatment. Source data files used for all the figures (Figure 3) are available via the BioStudies database https://www.ebi.ac.uk/biostudies/studies/S-BSST223). All scripts and software for nuclear segmentation and signal quantification are available via the Sainsbury Laboratory gitlab server (https://gitlab.com/slcu/teamHJ/publications/bhatia_et_al_2019; copy archived at https://github.com/elifesciences-publications/Bhatia_et_al_2019) (Bhatia et al., 2018). Plant Systematics and Evolution 199:121–152. Reviews of Modern Physics 66:1481–1507. Journal of the Optical Society of America 62:55. Thank you for submitting your article "The establishment of dorsoventrality in leaves does not depend on an asymmetry in auxin distribution" for consideration by eLife. Your article has been reviewed by Christian Hardtke as the Senior Editor, Dominique Bergmann as the Reviewing Editor and two reviewers. The reviewers have opted to remain anonymous. This has been a complicated paper to review (as you likely know) and the reviewers and I had a number of discussions about how to proceed. The consensus was that there were two, not totally integrated stories here, one on KAN/REV and a second on auxin distribution. The "Advance" format is really designed to build on a recent eLife paper, but the KAN/REV story was not thought to be advanced enough to be suitable for this. On the other hand, the auxin distribution section was a more developed story. Our conclusion is to reroute this into the eLife "short report" format, and so we ask that you submit a revision addressing the reviewers' concerns in that form. - Need essential information on the number of plants that were imaged in each experiment at each time point, how many plants showed the patterns shown in the figures, how many plants were discarded, because they suffered growth arrest etc. - You make the point that the 35S promoter may be highly variable in different transgenic lines and provide two examples with two very different reporter proteins in Figure 4. Since the reporters inevitably will have a massive influence on protein accumulation and hence the measured entity, this experiment does not support the claim made by the authors. It is essential to analyze multiple T1 lines of a single reporter to assess the variability of the promoter without confounding effects by the reporter. Ideally compare variation between 35S and other commonly used promoters, such as Ubiquitin10 or RPS5. - The critical experiments on auxin signaling are poorly described. One example is found in the Results and Discussion section "We first focused on incipient stages where PIN1 convergence pattern is obvious but the expression patterns of REV and KAN are being defined, by looking at later forming primordia (third, fourth or fifth). We found no asymmetries in auxin levels in the future adaxial and abaxial cells (Figure 2). - I´d like to point out that the reporters used do not measure auxin levels but are proxies for the cellular sensing of auxin. This needs to be corrected throughout the manuscript. - The color coding of Figure 2 is not explained and simply labeled R2D2 ratio. Does signal suggest absence of auxin sensing or the converse? - Again, it is quite difficult to know what one is looking at – where is the centre of the SAM, where are the first visible organs? - You claim that there is no asymmetry in R2D2 signal at the early primordia stage and provide longitudinal optical sections to support this claim. However, depending on which cells you define as being the primordium, there are substantial differences in signal intensities. Most notably, the "outermost cell" that is PIN1-GFP positive consistently appears to have much less R2D2 signal (see Figure 2 E, F, H). You need to be much more careful in interpreting, presenting and describing their data. - What does "mDII/DII (auxin)" in Figure 3 mean? Is it different from "mDII/DII (R2D2)" in Figure 3—figure supplement 1, or Figure 3—figure supplement 2 (R2D2 ratio), or Figure 3—figure supplement 5 (R2D2 auxin sensor), or Figure 2 (R2D2 ratio)? 3) The discussion of discrepancies between this report, previous reports (and now the new bioRxiv report from Jiao) need a more nuanced discussion. - While you focus here on auxin distribution mainly, Guan et al. describe a much more complex scenario, where auxin concentrations, the level of several ARFs and the final auxin signaling output level (DR5) do not clearly overlap. This view is not profoundly challenged by your work. - You argue that previous work by Guan et al., led to erroneous conclusions, because the DII line used shows an auxin independent, asymmetric expression possibly due to the 35S promoter. Proof for this is that another line expressing the auxin insensitive mDII marker shows the same asymmetry. This is in sharp contrast with Guan et al., (2017) or Wang et al., (2014) who did not find this asymmetry for the mDII line (Wang et al., 2014, Supplementary figure 2 for example). Are these just different interpretations of the same result (i.e. one concludes that the glass is half empty, the other one that it is half full)? If not, what is the cause of this discrepancy (biased selection of results in one of the articles, differences in growth conditions)? The patterns of the different markers used also seem highly dynamic and might even differ between plants at more less the same stage. Could that play a role? Looking at Figure 3G for example, one might conclude that the level of auxin is slightly higher at the adaxial side than at the abaxial side. The same for supplementary Figure 30. If true there might indeed be a (transient) gradient, in contrast to what is concluded. At a slightly later stage, auxin concentrations are higher in the internal (pro) vascular tissues, which is suggested by both R2D2 and DII (e.g. compare Figure 3G/J and H/K). Guan et al., also find this difference between the adaxial side and internal tissues. This implies that there might be less difference between the two markers (and the two manuscripts) than suggested. We have now performed ratiometric analysis of R2D2 on more seedlings than reported in the earlier version and clearly provide the information on number of plants and the leaves imaged in the main text and figure legends. Plants that suffered growth arrest, or damage while dissecting and imaging were not considered. Rather than assessing many new T1 lines, the eLife reviewing editor suggested an alternative which is to do time-lapse imaging of one line to demonstrate how the expression pattern changes from asymmetric to uniform. We now include such a time-lapse experiment on 3DAS seedlings expressing p35S::mDII-V showing a lower mDII signal intensity on the abaxial side of the leaves at 0h but then increased signal intensity within 12 hours (Figure 4—figure supplement 3). 2) The methods need to be described in more detail. Specifically. - The critical experiments on auxin signaling are poorly described. One example is found in the Results and Discussion section "We first focused on incipient stages where PIN1 convergence pattern is obvious, but the expression patterns of REV and KAN are being defined, by looking at later forming primordia (third, fourth or fifth). We found no asymmetries in auxin levels in the future adaxial and abaxial cells (Figure 2). We have now improved this text (Results and Discussion section). This has been addressed in the beginning of Results and Discussion section. We have replaced the word ‘auxin levels’ with auxin sensing’ throughout the text. We have now provided the colour stamp indicating dynamic range of the intensity based LUT used in the figures and provided a better description of what the ratios imply (DII/mDII or mDII/DII) in the text (Results and Discussion section). We have improved the annotations in all the figures. For example- we have now labelled the meristem with M in all the figures, labelled the position of first two leaves that were removed to expose leaves 3, 4, 5 (P3, P4, P5) in Figure 1 and also indicated where the first two leaves are in Figure 2. A major addition to this version of the manuscript is the quantitative comparison of DII/mDII ratio intensities in the adaxial and abaxial halves of young leaf primordia (Figure 3). We did this because we found that DII/mDII ratios appear highly variable and that depending on the optical section examined, different patterns could be perceived from visual examination (Figure 2 and associated supplements). 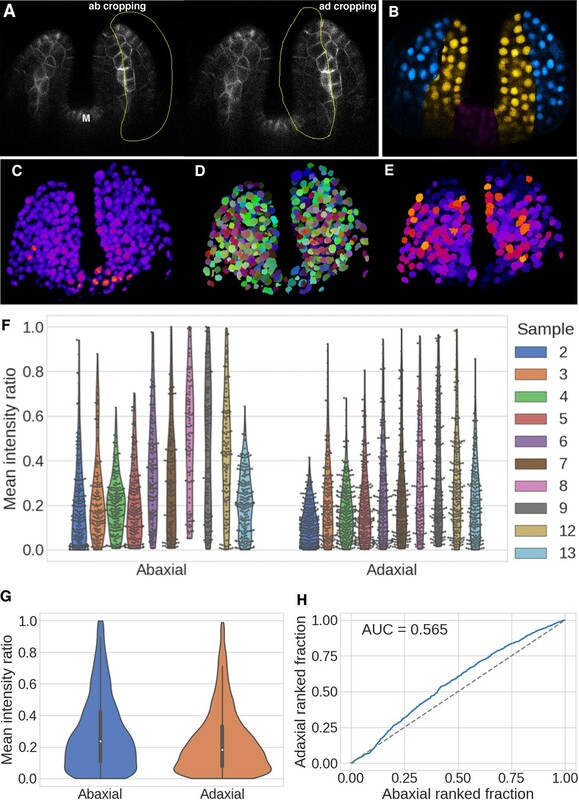 Hence, we used the PIN1-GFP marker as a dividing line to split R2D2 imaging data from whole leaf primordia into adaxial and abaxial halves. We then segmented the mDII signal to demarcate nuclei, calculated the DII/mDII ratios within these nuclei and averaged these results for each nucleus. This analysis thus encompasses all nuclei detected throughout the 3D volume of each leaf. Our results are provided in Figure 3 and clearly show that there is little difference in the distribution of DII/mDII ratio intensities between the two halves. If anything, we find a slightly larger proportion of abaxial cells with high DII/mDII ratios (low auxin sensing) compared to adaxial cells. We have now made the descriptions clearer. mDII/DII (inverse plotted ratio of intensities of DII and mDII) is an indicator of cellular auxin perception with high intensities corresponding to high auxin sensing (please see above). A central message from Guan et al., is that low levels of auxin limit WOX/PRS expression in adaxial tissues while ARF2/3/4 repress these genes abaxially – hence they are expressed in the middle domain. In this study, we show that cellular auxin sensing is not lower in adaxial tissues compared to abaxial tissues – instead they are similar. Nevertheless, it could still be argued that low auxin levels may limit WOX/PRS expression in adaxial tissues, as Guan et al., propose. Are WOX1 and PRS normally expressed only in cells with higher cellular auxin sensing than adaxial cells? In this study, we find high levels of auxin sensing in cells that also express high levels of PIN1-GFP (provascular cells). Is this where WOX1 and PRS are expressed? At least for PRS, the answer is no – data from Caggiano et al., show that although both PIN1 and PRS are expressed in the middle domain, PRS is not restricted to those cells expressing high levels of PIN1-GFP in the centre of the leaf (pro-vasculature). Hence PRS expression does not only occur in cells with obviously higher levels of auxin sensing compared to adaxial cells. Perhaps more convincingly, in Caggiano et al., it was also shown that if auxin is applied exogenously, WOX/PRS do not become expressed ectopically. Overall then, the data in both this study and Caggiano et al., argue against a role for auxin being a limiting factor for defining WOX/PRS expression in the middle domain. Instead, these data are consistent with the hypothesis proposed in Caggiano et al., which is that WOX/PRS expression is actively repressed in adaxial tissues by the HD-ZIPIII proteins. We do not argue against Guan et al. in terms of what happens in abaxial tissues. These points are now better described in the Discussion section. Asymmetric mDII expression is only observed in very young leaf primordia at 3DAS. Previous studies such as Guan et al., (2017) or Wang et al., (2014) or even the new preprint from Jiao at BioRxiv do not present mDII data in leaf primordia at this early stage, only older stages. This is discussed in detail in our text, with the conclusion being that the data they report is not sufficient to justify their conclusion or properly compare to our data (Results and Discussion section). As the reviewer suggests, a striking feature of R2D2 ratios in young leaf primordia is the variation in pattern. Not only between leaves but even within adaxial and abaxial tissues of the same leaf (Figure 2). Hence being restricted to a limited number of individual sections for analysis easily leads to bias. To eliminate bias in our analysis we therefore undertook a quantitative comparison of DII/mDII ratio intensities in the different sides of the leaf. This involved assessing all detectable nuclei within the adaxial and abaxial tissues of twenty leaves, using PIN1-GFP to mark the boundary between the tissue types. Our quantitative and comprehensive analysis clearly indicates no dramatic differences in R2D2 ratios between adaxial and abaxial nuclei. We conclude that for a case such as this, taking a quantitative and unbiased approach to the cells chosen for analysis is absolutely critical for making a fair conclusion (See Results section). We thank Mary Byrne for critical feedback on the manuscript and Teva Vernoux for kindly providing the seeds of plants expressing p35S::DII-VENUS and p35S::mDII-VENUS transgenes. We also thank Jim Haseloff for providing the seeds of plants expressing p35S::H2B-mRFP1 and p35S::EGFP-LTI6b transgenes. We thank Sevi Durdu for providing technical advice on DII/mDII ratio calculation shown in Figures 1 and 2 and associated supplements. © 2019, Bhatia et al. Monica Pia Caggiano et al. In plants the dorsoventral boundary of leaves defines an axis of symmetry through the centre of the organ separating the top (dorsal) and bottom (ventral) tissues. Although the positioning of this boundary is critical for leaf morphogenesis, how the boundary is established and how it influences development remains unclear. Using live-imaging and perturbation experiments we show that leaf orientation, morphology and position are pre-patterned by HD-ZIPIII and KAN gene expression in the shoot, leading to a model in which dorsoventral genes coordinate to regulate plant development by localizing auxin response between their expression domains. However we also find that auxin levels feedback on dorsoventral patterning by spatially organizing HD-ZIPIII and KAN expression in the shoot periphery. By demonstrating that the regulation of these genes by auxin also governs their response to wounds, our results also provide a parsimonious explanation for the influence of wounds on leaf dorsoventrality.